Brookline, Massachusetts proudly boasts of owning a school house that is over two hundred years old. It is the Putterham School which was built in 1768 at the juncture of Grove and Newton Streets (1897 atlas). 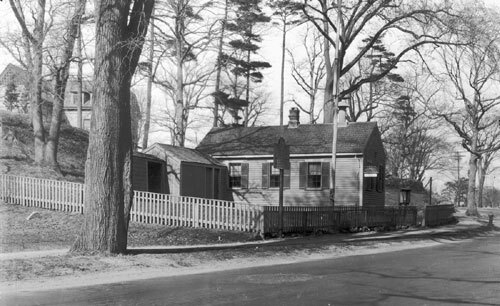 In April of 1966 the school was moved from its original site on Grove Street to its present location at Larz Anderson Park. The actual move and plans for the building’s restoration were conducted under the direction of Race Architectural Restoration Enterprises, Inc. (R.A.R.E., Inc.). The Brookline Board of Selectmen and the Brookline Historical Society worked together for several years to accomplish the move. The Historical Society has in its possession a complete photographic and narrative history of the school, prepared for it by R.A.R.E., Inc.
Of unusual interest in the building was a portion of plaster painted black on which a “number work lesson” had been written with white chalk by Miss Mary Elizabeth Hyde, for many years the teacher at Putterham School, and dated “Monday/October 18; 1897.” This was revealed when many layers of repair cloth had been removed from the walls. Miss Hyde’s handiwork is now preserved and protected by a glass covering. The building, after being moved, was reset on a solid fieldstone foundation. Antique glass was found for the windows. Some structural repairs were made where deterioration and erosion made the building unsafe. The shade of red used to paint the exterior conforms to the color applied originally as revealed by paint scrapings. Since its original construction in 1768, the school has been altered frequently, showing various styles and techniques in construction used during the eighteenth, nineteenth, and twentieth centuries. 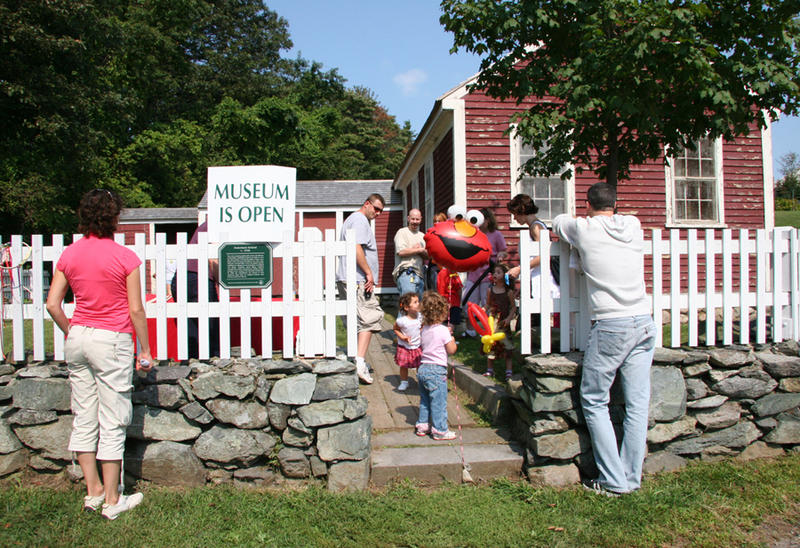 The original one-room school house was enlarged in 1840 by an addition to the rear. In 1847 a shed was built for storing coal or wood and providing an entry vestibule. 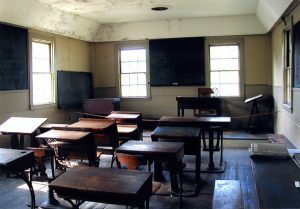 According to town records, in 1855 the ceiling in the schoolroom was raised, the windows enlarged, and the desks and chairs repaired. The double privy was built around 1898, probably re placing an earlier single privy. There is some evidence that in 1938 the school was used temporarily as a Catholic church and at some time following World War II as a synagogue. Mrs. Dean Peabody, Sr., the chairman of the Putterham School Committee of the Brookline Historical Society, and an alumna of Putterham School, wrote an article entitled “When I Went to School” that appears in the Proceedings of the Brookline Historical Society for 1959-1963. In that article she refers to the Putterham School as the “Newton Street School” and as the “Southwest Primary School.” Brookline historians have never quite agreed as to the original name of the school. Nevertheless, it is generally known as Putterham School. The present use for the schoolhouse is an educational museum showing how a one-room school was set up, displaying books, teaching aids, and various items of schoolroom equipment. 12:00 p.m. – to 3:00 p.m.